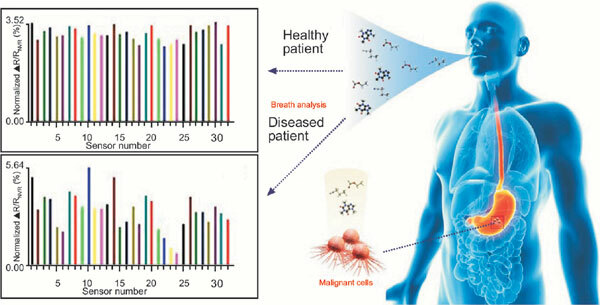 Background: Analysis of volatile metabolites derived from the human breath or biofluids provides noninvasive means of detecting and monitoring diseases that occur throughout the body. Diseases arise from different mechanisms that cause alterations in normal physiological processes. Mechanisms of disease (pathogenesis) result in the production of unique mixtures of abnormal volatile organic compounds (VOCs), referred to as disease biomarker metabolites when associated with specific diseases. Regardless of where disease biomarkers originate in the body, they are picked up by the circulatory system and eventually expelled out through the lungs. Analysis of complex mixtures of disease biomarkers provides effective diagnostic clues for detecting the presence of specific disease processes occurring in the body. Methods: Recent progress in the development of electronic-nose (e-nose) applications and technologies for clinical examinations and human disease diagnoses are reviewed. Results: Metabolomics has been useful in identifying biomarkers and mechanisms of disease, but is often time-consuming and not easily applied to disease diagnosis. E-nose devices are relatively new gas-sensing technologies that are small, simple, portable and particularly useful for noninvasive early disease detection. Some major advantages of using e-noses for disease diagnoses are that they provide quicker, more efficient diagnostic results and cause less stress, anxiety, and no pain to patients. Conclusion: Recent advancements in the use of e-nose devices to detect complex mixtures of disease biomarkers are providing the great potential for these instruments to facilitate and accelerate point-ofcare clinical disease diagnoses. Keywords: Aroma signature patterns, breathprints, disease biomarkers, electronic aroma detection, e-nose, metabolomics. Keywords:Aroma signature patterns, breathprints, disease biomarkers, electronic aroma detection, e-nose, metabolomics. Abstract:Background: Analysis of volatile metabolites derived from the human breath or biofluids provides noninvasive means of detecting and monitoring diseases that occur throughout the body. Diseases arise from different mechanisms that cause alterations in normal physiological processes. Mechanisms of disease (pathogenesis) result in the production of unique mixtures of abnormal volatile organic compounds (VOCs), referred to as disease biomarker metabolites when associated with specific diseases. Regardless of where disease biomarkers originate in the body, they are picked up by the circulatory system and eventually expelled out through the lungs. Analysis of complex mixtures of disease biomarkers provides effective diagnostic clues for detecting the presence of specific disease processes occurring in the body.